West Coast Casting Cast, Co Ordinate, and Assist Film Productions, TV series, Commercials and Music Videos in the West of Ireland. 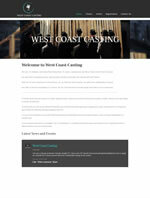 West Coast Casting specialise in supplying extras, special extras, models and people with special skills and talents. With over 10 years experience in the industry, they can fulfil any brief required, no matter how challenging or unique. Their office is based in An Spidéal, Co. Galway. We are a local business that will supply local talent to your production.